The Days of Johann, an agility dog! : Lucky us! We got to see a Luna Moth up close and personal. Lucky us! We got to see a Luna Moth up close and personal. 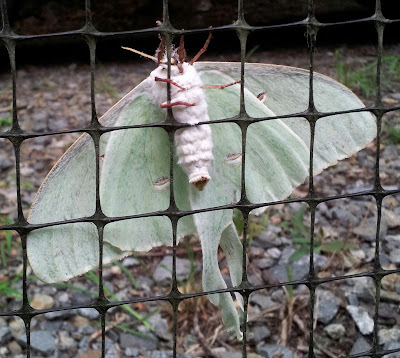 You may remember that back on July 4th, Mum and I found a caterpillar of the beautiful and almost extinct Luna Moth. 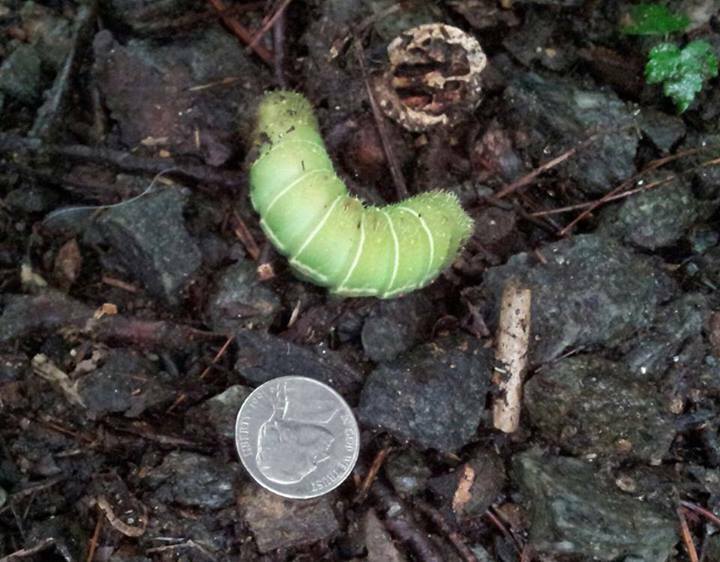 Mum was so excited because she hadn't seen one of these caterpillars before, but knew almost instantly what it was, as it was so big, fat and green! See, with a nickel beside it you can tell how big and fat he/she is! 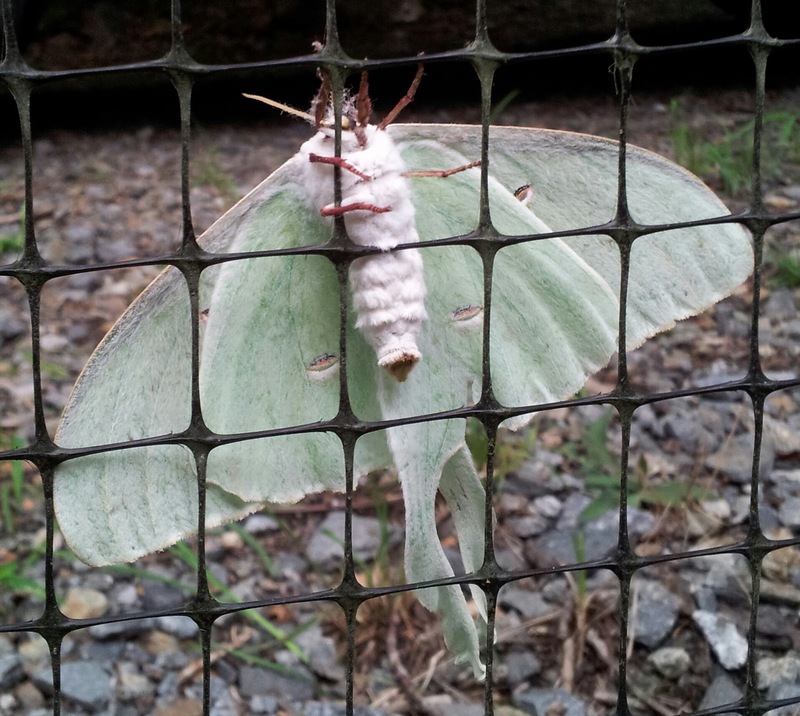 The Luna Moth, or Actias luna is sometimes also known as the the "Giant Silkworm Moth". Once they are adults they have a wingspan of four and a half inches. 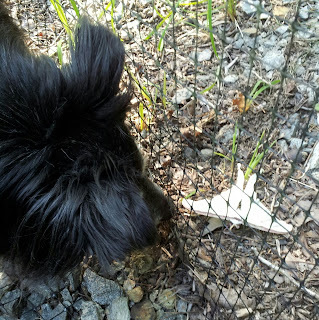 We found one on the fence a morning or so ago! As an adult, the female lays eggs on the underside of Black Walnut, or similar tree, leaves. She lays about 200 eggs in small groups, up to about 600 eggs in total. About 10 days later the eggs hatch and the caterpillars begin eating as soon as they leave the egg. Over the next 3-4 weeks they feed on leaves, and then when they are fully grown as caterpillars (about 2.5 inches long) they begin to spin silk like stuff from an area where it's mouth would be and wrap itself in a leaf. The caterpillar will usually stay in this cocoon for two to three weeks. Once it emerges, it attaches to a tree or similar to mature for a day, then that night it will fly off to mate. The Luna Moth only lives for about a week, never feeds as it doesn't actually have a mouth, and it's only purpose in life is to mate. Luna Moth's used to be very common, but now are nearly extinct in some areas, and very uncommon to see nowadays. We feel lucky we have been able to see one at least once a year since we've lived in the mountains! 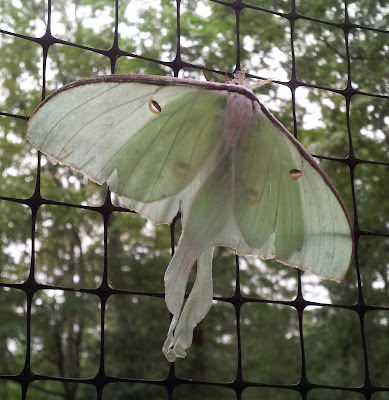 By night time, the Luna Moth was dying, and then it fell off the fence, and we see this morning that it's being consumed by the little ants and other moth eating bugs. So cool! The luna moth is so beautiful! What a great post, Johann! That is a gloriously beautiful moth. I love moths and butterflies and their caterpillars. I think of them as beauty on the wing. 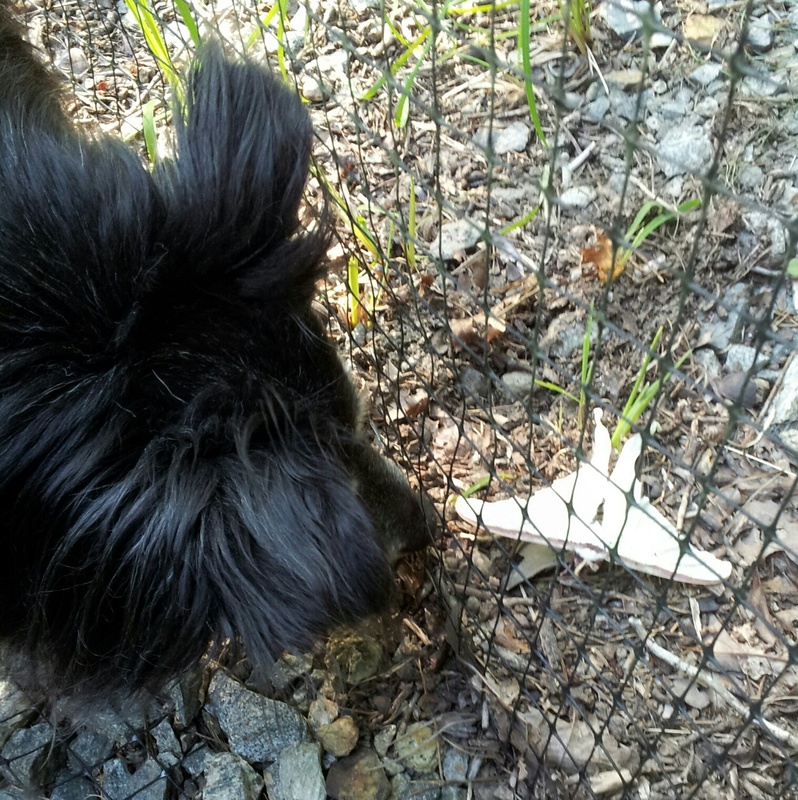 Katie wants to know if she can eat it, too? She loves bugs!